AvailabilitySame day despatch (by trackable courier) if ordering before 1pm (Weekdays only, excluding holiday closures). 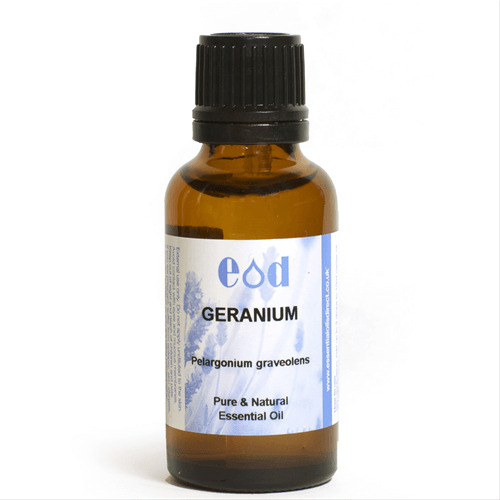 100% Pure and Natural Geranium Essential Oil - Suitable for use in aromatherapy blends, candle manuacture or inclusion in cosmetics subect to approved safety levels. Supplied in a variety of sizes and supplied in amber glass bottles with integral tamper evident dropper cap or aluminium bottles depending on the size. All oils supplied have a best before date and batch number for full traceability and quality control. Click other tabs for more detailed information. Method of manufacture: Steam distilled. Composition: This material is 100% Pure & Natural. Preservatives: In accordance with Article 14d of the EU Cosmetics Regulation no preservatives have been used or added during production. SVHC: This product does not contain any substances of very high concern. Substances according to Annex II and III: This material does not contain any of the no substance listed in Annex II and III of EU Cosmetics Directive. With the exception of those components listed in the EU Allergens and IFRA declarations. Pesticides: Not tested routinely, but historic testing has shown results to be well within EU limits. Ionising Radiation: The product has not been treated with ionizing radiation. Residual Solvent: No solvents used. Colorants: In accordance with Article 14c of the EU Cosmetics Regulation no colorants were used or added during production. Nanomaterials: In accordance with EU Cosmetics Regulation, this product does not contain nanomaterials nor have any been used or added during production. BSE/TSE: We hereby guarantee that this material does not constitute any health hazard in connection with B.S.E. / T.S.E. The basis of this claim is that the material concerned does not derive from animal origin and neither the producer nor Essential Oils Direct use any extracts of animal (cattle, sheep, goat etc.) origin in the manufacture of this product and indeed do not have on site any such products for any purpose and further that the plant on which production is carried out does not have contact of any type with products of such origin. GMO EC Regulations 1829/2003 & 1830/2003: No material of GM origin has been used at any stage of the production of this product. Gluten Free: We hereby state and certify that this product does not contain any gluten. Vegetarian: This material is suitable for Vegetarians. Halal: This material is not certified Halal. Kosher: This material is not certified Kosher. Heavy Metals: Not tested routinely, but historic testing has shown results to be well within EU limits. Animal testing: We hereby certify that this material has not been tested on animals either by us or by the producer or anyone else in the supply chain. “Has not been tested” means that we have not tested ourselves nor has any third party been commissioned to test on our behalf. Reference to any testing in literature to which we associate directly or indirectly is based on reported industry data in the public domain and does not indicate any animal testing associated to this source of this ingredient. This statement applies to all common cut off periods in force in the cosmetics industry and specifically a period not less than 15 years lapsed from date of this statement. We further declare that this material does not derive from animal source nor have animal products been used in its manufacture. Furthermore animal products do not form part of the product range handled or processed on the plant / equipment producing this item. Microbiology: Due to the nature of this product (waterless system) – no microbiological activity will be present in the oil. Regulation 1333/2008 Food Use: Conforms to Regulation 1333/2008 and is suitable for food flavouring use, subject to all the usual formulation considerations. FEMA 2508. Regulation EC 1223/2009: We hereby confirm that this material is acceptable for use in cosmetic applications governed by Cosmetic Regulation EC 1223/2009. We further confirm this material does not contain any components indicated as prohibited and any components listed as restricted will be indicted on the corresponding Cosmetic Allergens Declaration or IFRA certificate. UV Filter: In accordance with Article 14e of the EU Cosmetics Regulation no UV filters have been used or added in the course of production. Cruelty: To the best of our knowledge, there are no instances of cruelty to animals that take place during the manufacture of this material. Palm Free: We confirm that this material is free from palm oil and palm oil derivatives.